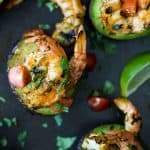 30 Minute Grilled Cilantro Lime Shrimp served in a Grilled Avocado Boat a light flavorful dish for the summer! 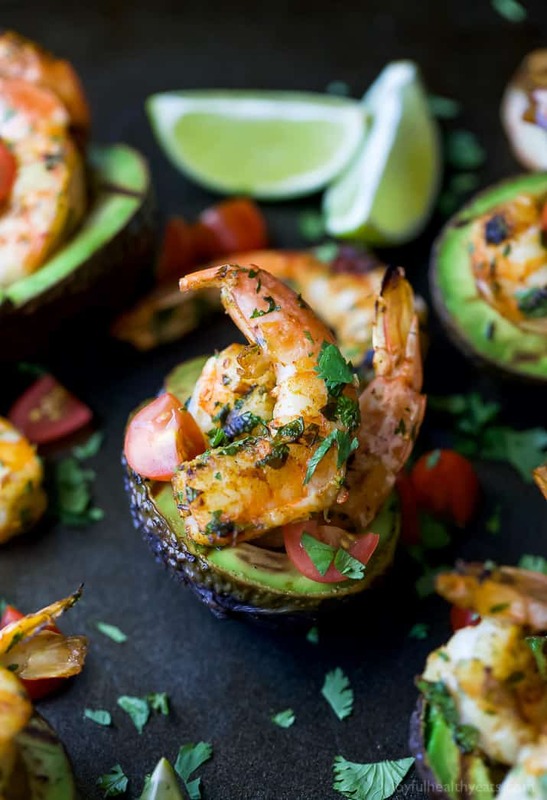 Easy 30 Minute Grilled Cilantro Lime Shrimp served in a Grilled Avocado Boat. 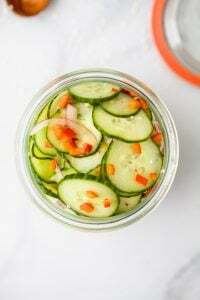 This light & flavorful recipe makes the perfect party appetizer or main dish for the summer! Ugh… right now I have a horrible headache! Ok, now onto the important stuff. 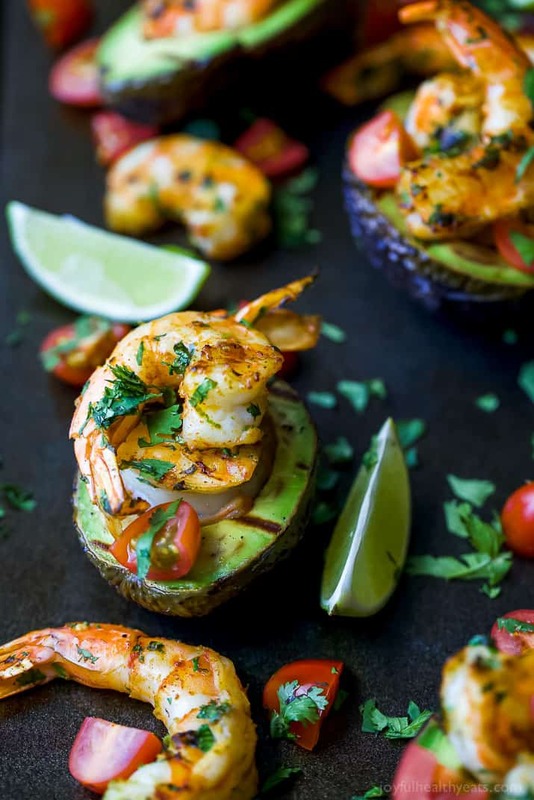 These Grilled Cilantro Lime Shrimp in an Avocado Boat. 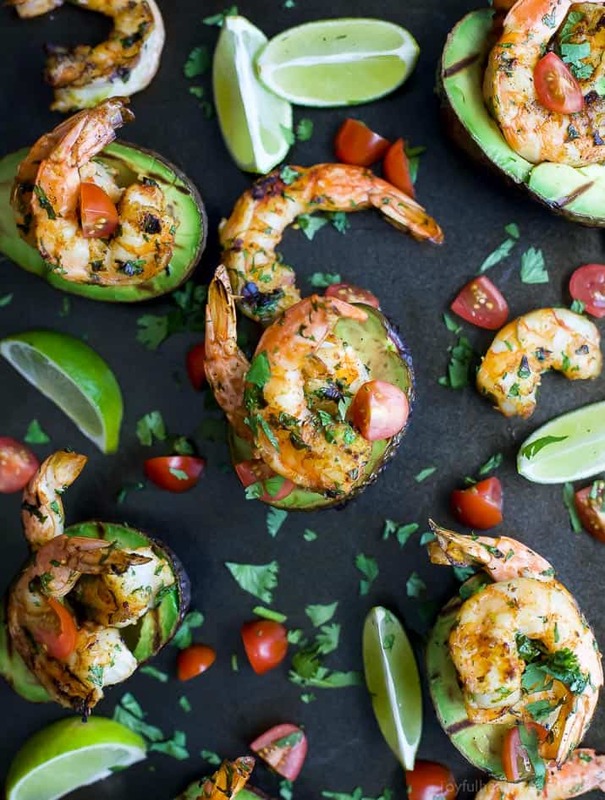 Guys, did you know that you can grill avocados? Yup, you sure can and they are delicious! 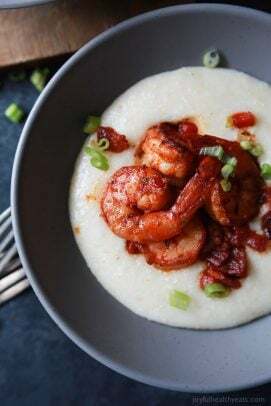 All you do is brush them lightly with a little canola oil so they don’t stick to the grill, let them sear for a couple minutes and deliciousness awaits you on the other side. 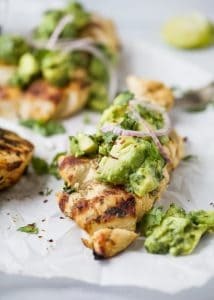 Avocados don’t have a lot of flavor in general but when you put them on the grill, they soak up a smokiness from the grill. Basically it makes the avocado that much better! 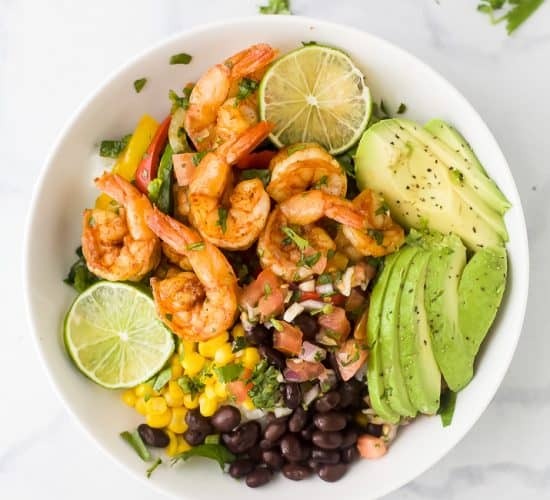 The other component to this dish is the Cilantro Lime Shrimp. Now, you have to be careful when it comes to citrus and seafood. The acid from citrus can actually “cook” seafood if you’re not careful. Hence ceviche, which is raw seafood that’s cooked in lime juice. 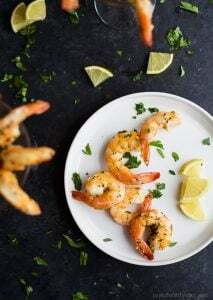 So for this recipe as a way to avoid cooking the shrimp before it hits the grill I added lime zest to season the shrimp instead of lime juice. You still get the same lime flavor but it helps you not end up with a rubbery shrimp in the end. 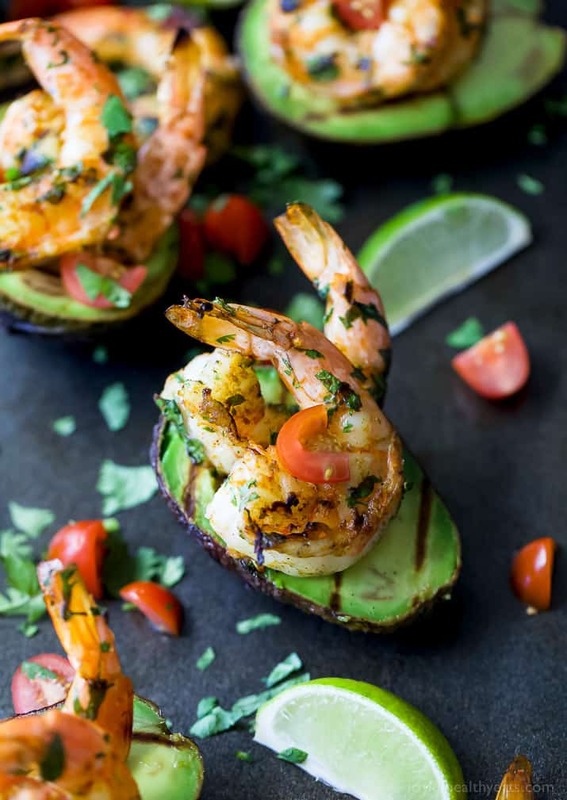 I served the grilled shrimp inside of the grilled avocado … almost making the avocado a little boat or vehicle for the shrimp. So cute right?! Then I topped them with sweet cherry tomatoes. 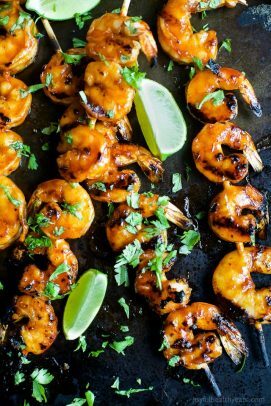 Serve them with a lime wedge on the side for an extra burst of flavor … plus it really brightens up the dish. 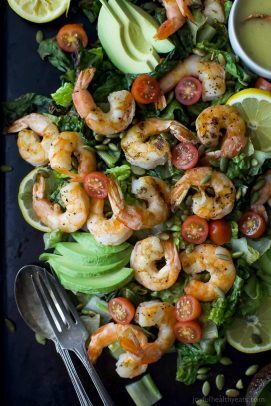 This Cilantro Lime Shrimp would be a great appetizer for your next party or a main dish during the week. Especially complimented with a glass of Sauvignon Blanc. Yum! 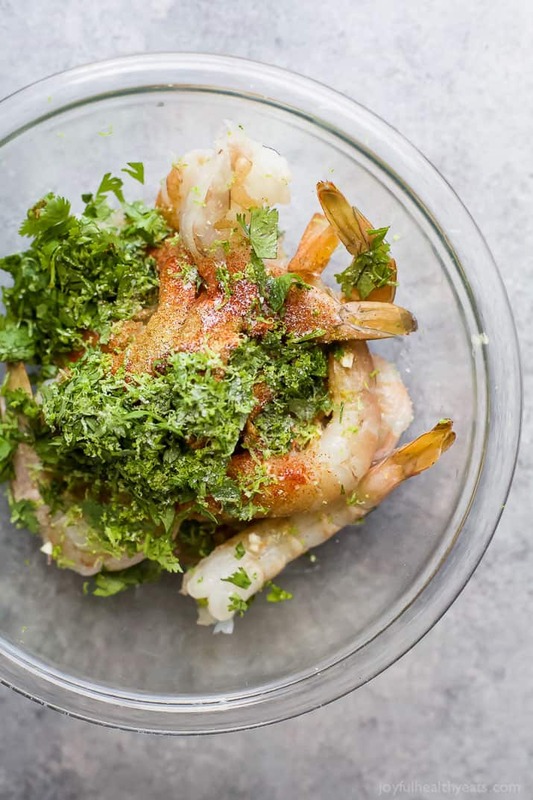 Heat grill to medium high heat, about 375-400 degrees F.
To a medium bowl add shrimp, cilantro, cumin, smoked paprika, minced garlic, lime zest, salt and olive oil. Toss all the ingredients to coat completely. Spray each avocado half with cooking spray. Next, spray grill grates with cooking spray or wipe down with an olive oil soaked rag. 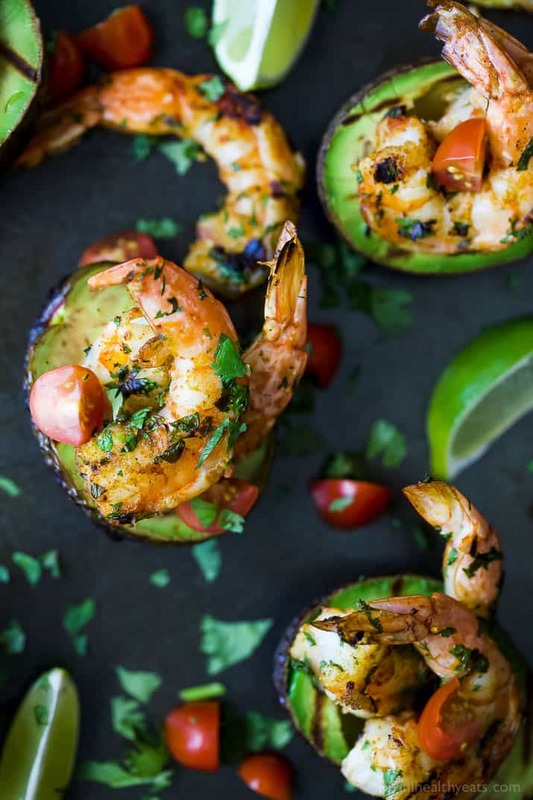 Place shrimp directly on the grill, along with avocado, flesh side down. 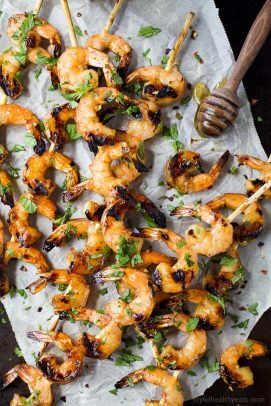 Grill each side of the shrimp for 3 minutes. Grill avocado for 3-4 minutes on the flesh side. Remove everything from the grill. Serve shrimp inside of the avocado hole where the seed use to be. Top with cherry tomatoes. Well my mouth is watering! 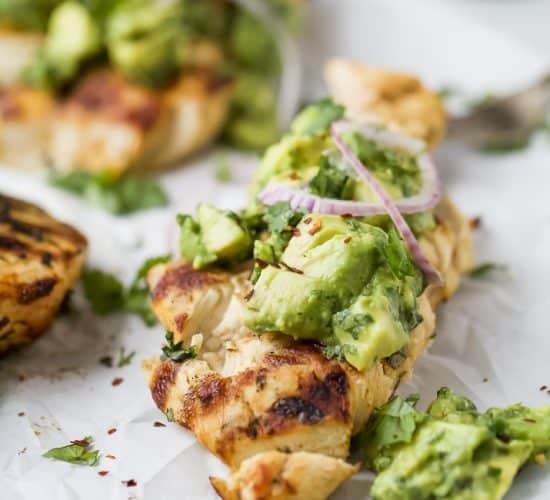 I have never tried grilled avocado! I see what I have been missing. 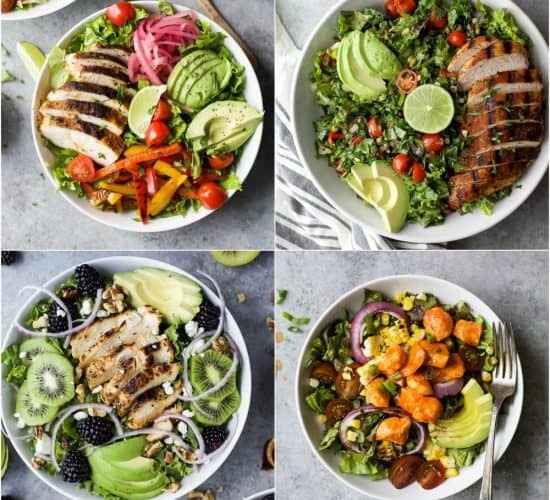 YUM, looks so fresh and flavorful! I love this idea! Craving this now! 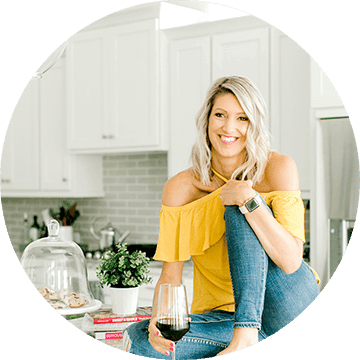 This sounds like a perfect summer dinner to me! 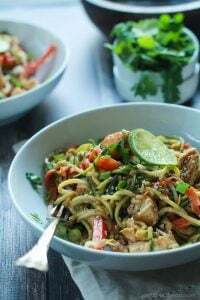 So pretty and flavorful! 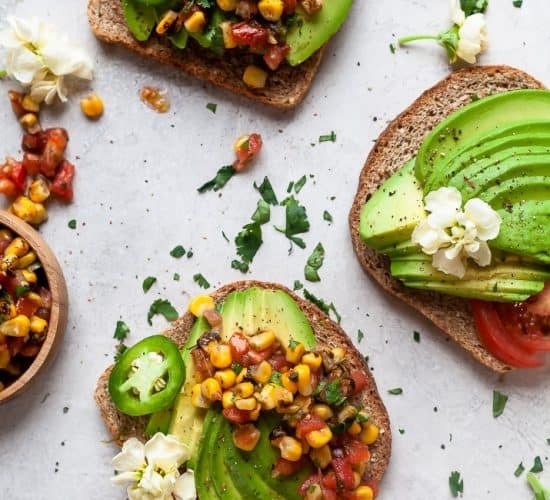 I love everything with avocado! This looks divine! 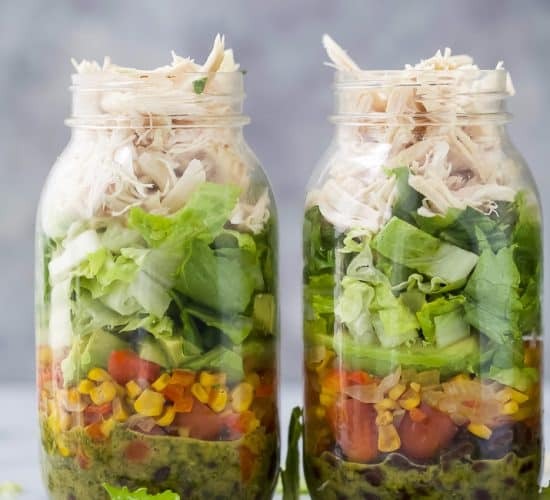 This looks delicious for summer parties! Perfect party appetizers!